Built by human. Forged in fire. Warning: This Pre-Built AMD 64 x2 is about to be destroyed! Then brought back from the dead. 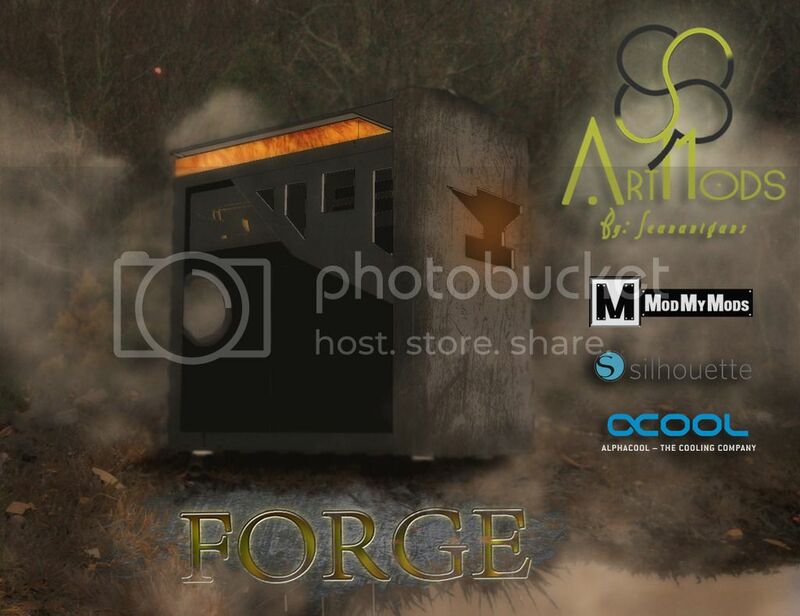 I want to thank my new sponsors ModMyMods and Silhouette, and now ALPHACOOL for supporting ArtMods and FORGE. 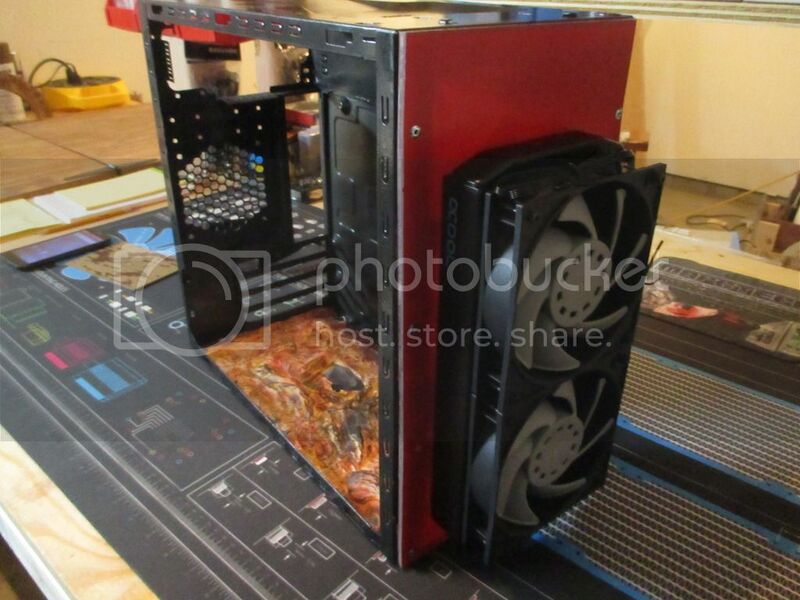 This Mod Is built off of a old Pre-Built HP. It bothered me... A LOT! So I decided I do some simple mods to make it better. Then I got carried away. This mod is/was a "Live update" on twitter and still has a little bit more to go but is slowing down right now. So Join us for the finale! 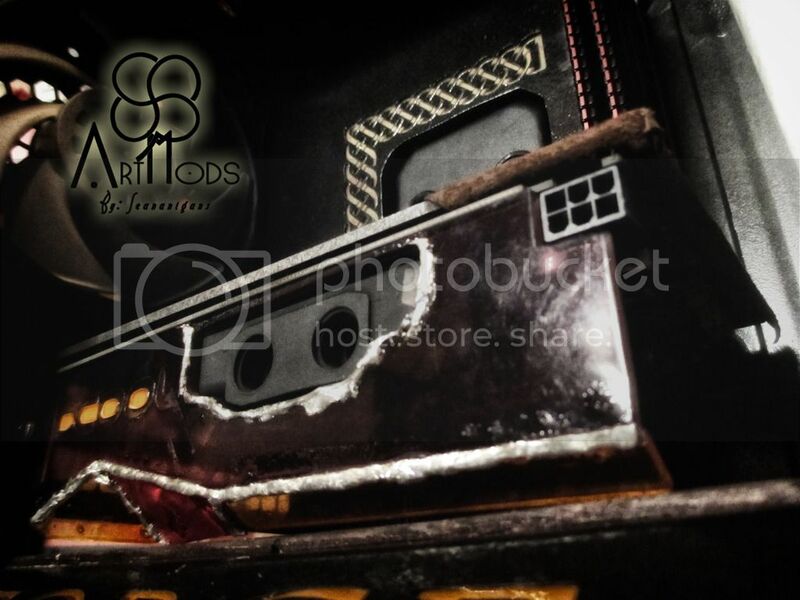 @ArtMods_ Enjoy! All i can say is... EW, I gotta fix this box of coal. So ill tare it apart! New Front Panel. Drawn, Cut, And Painted! All of this Acrylic is left overs, so I thought one piece looked kind of cool so I'm going to use it. I made a base plate to display the name "FORGE" and a PSU cover because I am using things that I have. The PSU is original to the case and is... well. Scary. Printed out the stencils on Vinyl, then I cut them by hand. 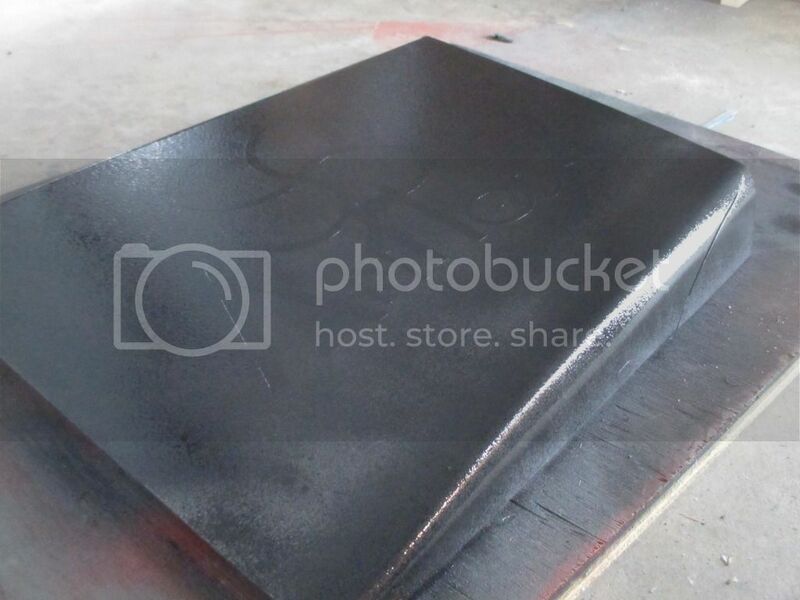 Next I use this Putty to create the Molten Steel under the base plate. I highlighted hot spots I wanted to stick out. I used acrylic paint after the putty dried (took 24 hours) I layered from Light to dark starting from a base coat of White and then dry brushed the yellow,orange, two different hues of red, brown and Carbon black. I made the Decision that I am not using the original hardware, I am using Mini ITX and AMD Athlon X4 860k and Just because its the only GPU I have in my parts box... a 8800 GTX. Gotta try to find a "R series" GPU. I installed all the hardware and started fiddling with the details. The first thing I made is the optical drive bay cover. Its still drying right now, I have some more work to do on it when the paint drys. That hole in the middle is for the power button. I had to move it from the front because the cable was 1/8 of an inch short. So now creativity comes into play. 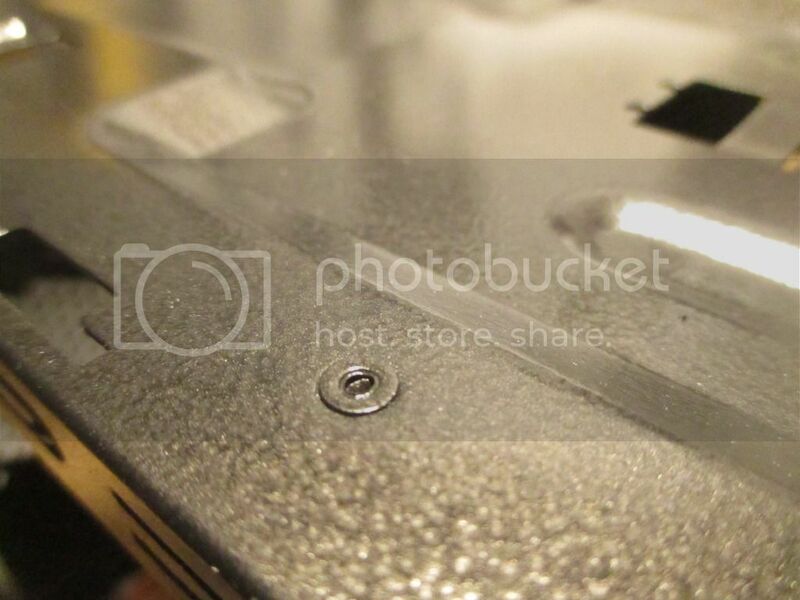 After that, I decided to paint the top of the heatsink. Next I made the GPU Back Plate. I cut out a stencil I made on Vinyl and then applied before painting. So far this is where I am at. I have to fix the LED's in the front, cut the back panel, add case feet, clean up all of the text and logos and make a top panel. I'm not sure if ill be doing anything else to it other than the things I mentioned, I keep getting more ideas but I don't want to over do it. Thank you so much! I am excited for the new designs to come into play. The case keeps evolving! A bit of Concept art for you! Thank you! There is more to come, I have a lot of Ideas to implement on this little fella. Awesome work! Love the step by step photos too! Thank you very much! I will be writing up some different tutorials as well on here for the community almost like this. I have a lot more work to do on this Case Mod so there will be more updates and photos for you all! Very nice work. The render picture has an acrylic/glass window on the side panel or is open? Thank You! The Window will be open. I was debating on putting a window on it but a forge doesn't have windows. I'm trying to keep it as true as I can within reason. I will be updating it as progress is made. I am waiting on Acrylic to arrive Monday. I'm prepping the shop for the delivery as I type. So as I wait for the acrylic to arrive I have been working on some designs. This update is just some concept art/Design that I have been working on for FORGE. trying to smooth things out, fix design flaws and create a game plan. 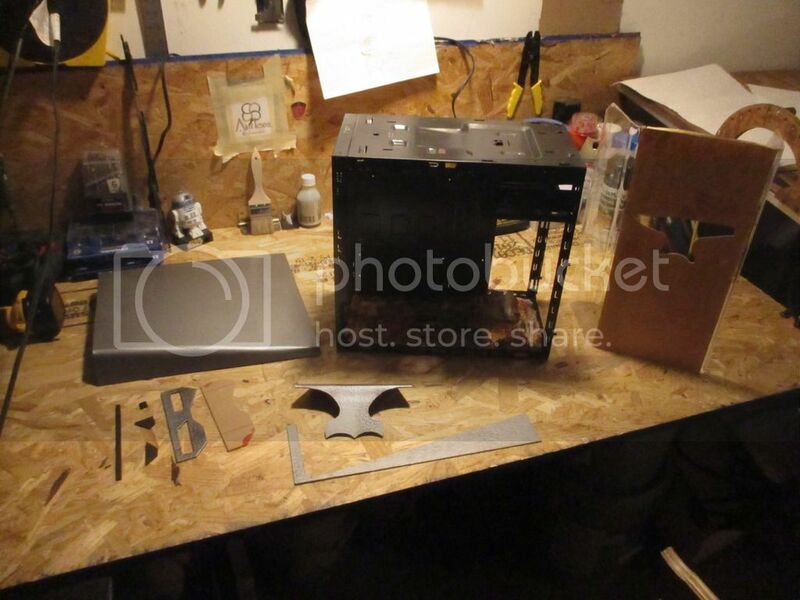 This first design is the back door panel of the case, I will implement a hammered metal texture as well as a beveled door panel to allow more room for components/cables to be routed. 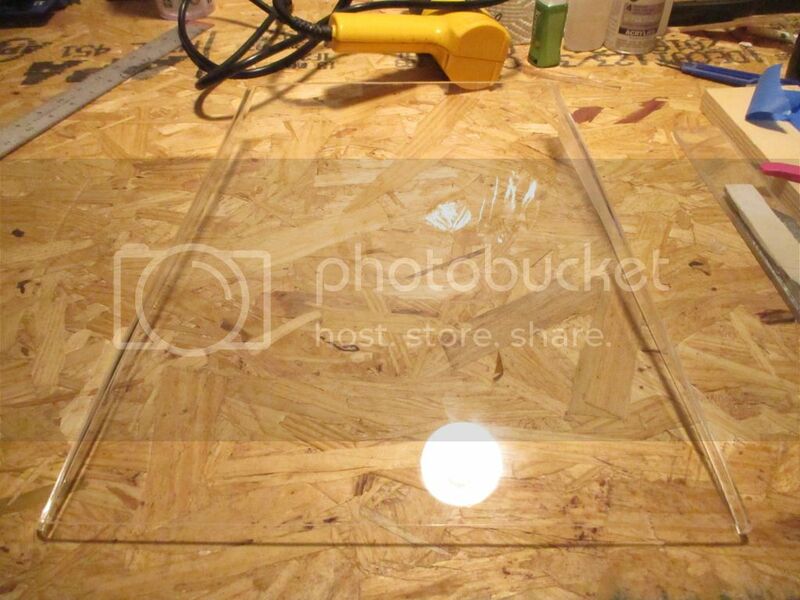 The top above the res, will be hinged and will open up to fill the res. Here you can the the res one more above the case (orange rectangle) Below that you can see the front of the case as well as the side door panel. Note: there will be no window, the front is an open concept. 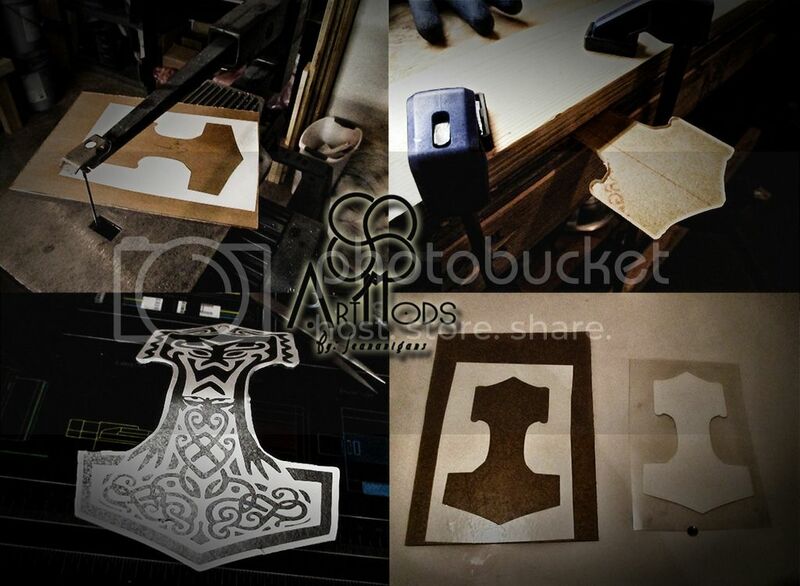 In the front of the case, you will find the Anvil logo, that will be cut out to allow air to flow to the radiator. This logo will also glow orange. Here is the design for the I/O cover on the motherboard. The design takes advantage of all possible space and allowing the fan cable to be tucked away underneath. The Orange inside will glow as well as be inset. I will not go with the brushed metal, Instead I will stick with the hammered metal look to coincide with the rest of the build. There will be more updates to come. I hope you enjoyed the artwork! So here is what the plan was. And then I decided Im going to do this right. I am not going to settle for how this looks in the above photos. So out with the parts! 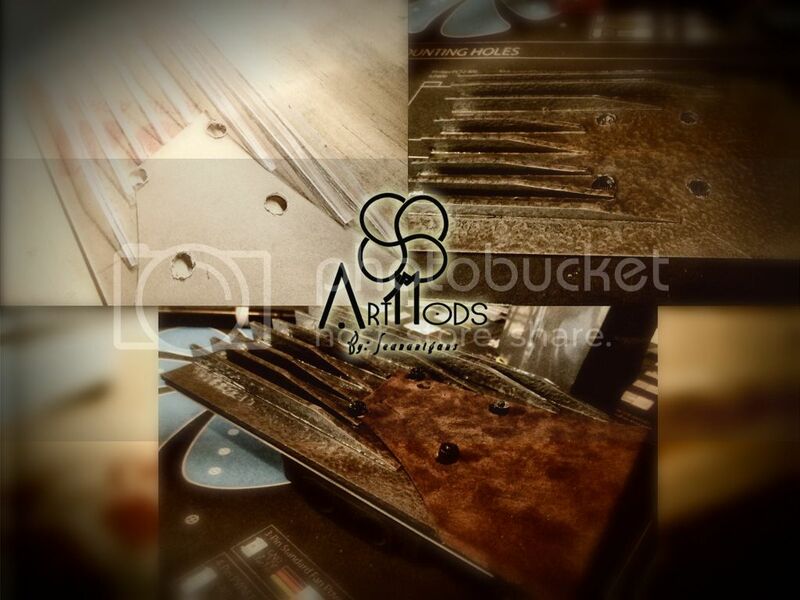 Thanks to [B]ModMyMods[/B] for their sponsorship, This project has come so far and is going further! I pulled all the parts out and put them away. 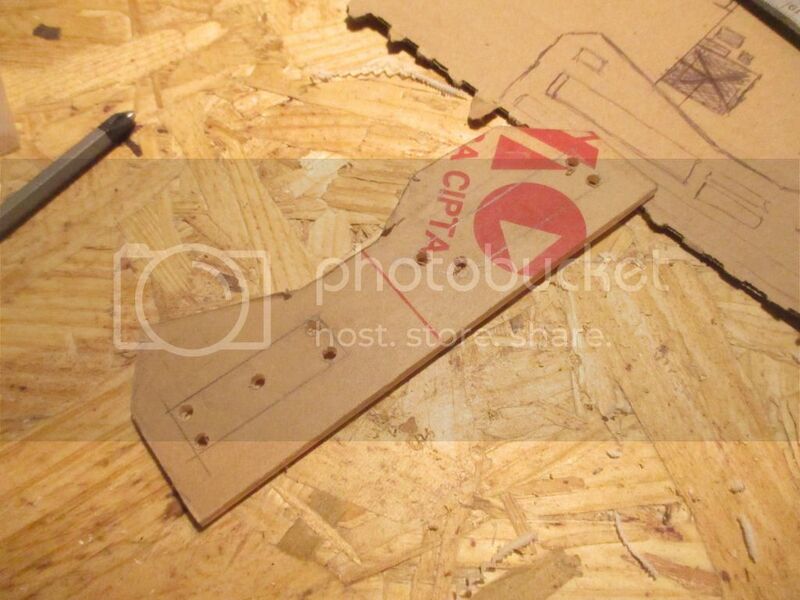 I then decided to cut the front out to make a hole for a radiator mount. From there I decided to make the front panel once more, only this too will not be a door as well. 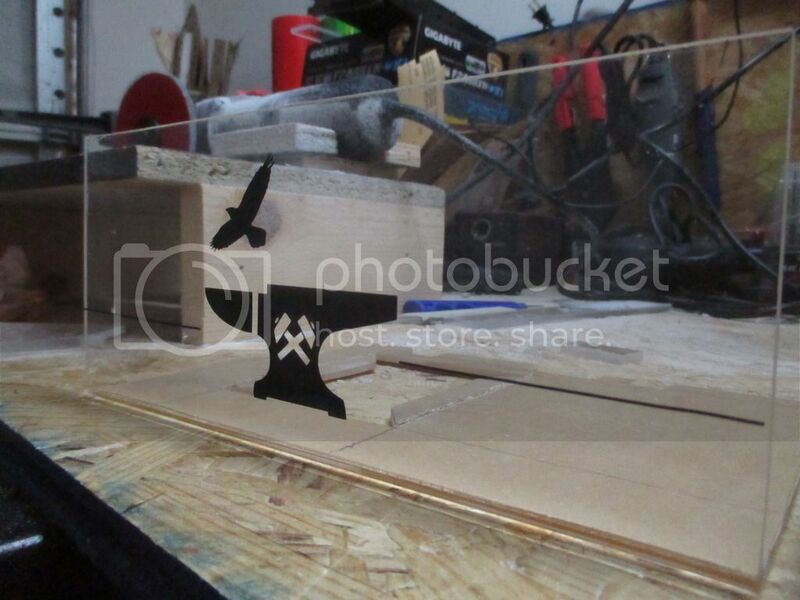 I used 100% cast acrylic and a 20 tpi blade on the scroll saw. I built a acrylic bender but I am going to need to make a heating element for it so I have to do it the old way (which DOES work). Then it was time to make the Flap at the top. I chose to add a hammer in the front hanging down instead of having it attached. Then I started on the back panel. I wanted it to look like an exhaust vent. With this design I have more than enough room to run tubes and cables. I gave it a good paint job, front and back. as well as the front flap. Then we moved into the inside of the Case to the Motherboard, where I made the motherboard I/0 Cover. I gave the Case its self a once over with a final coat of paint. 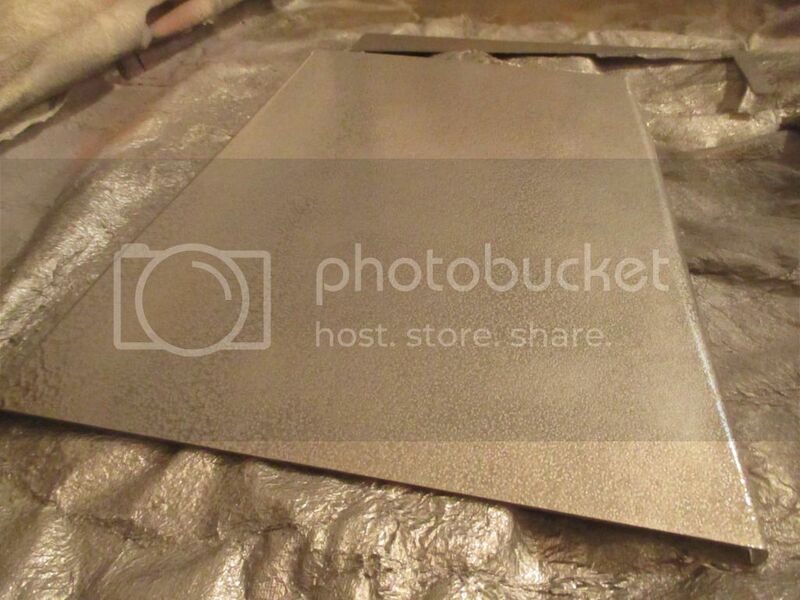 I made it look like dark hammered metal using a faux finish paint. As of right now, I am working on making 2 different custom res's. One will run along the top of the case horizontal and another will go inside. as you can see in the below concept art. 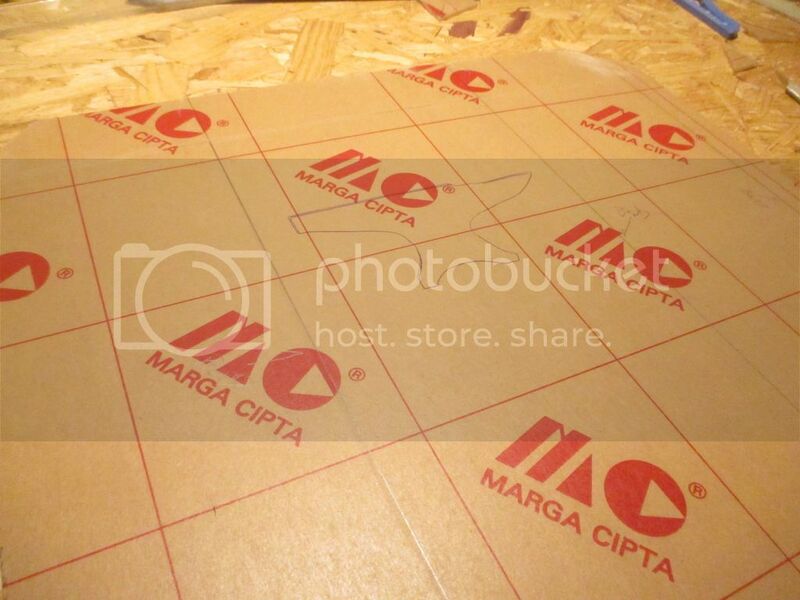 do you have your own shop with tools? Were good update full of pictures! 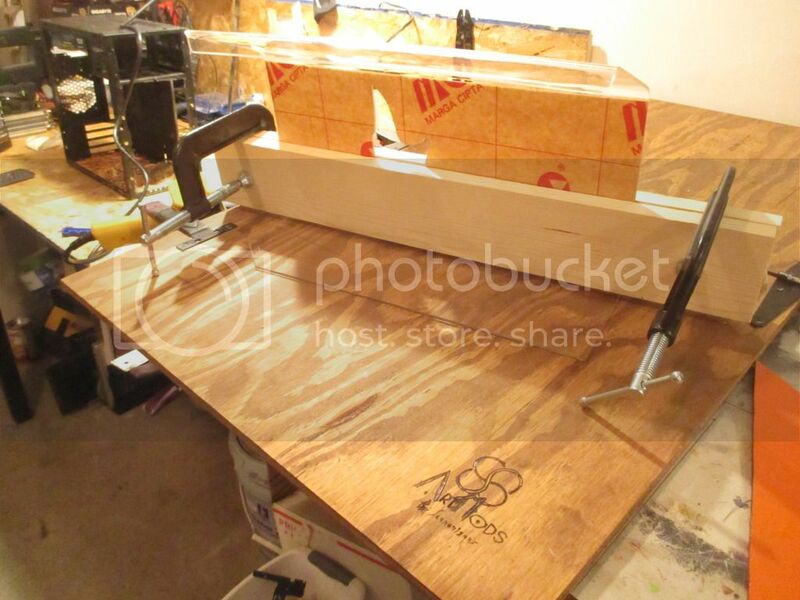 Yep, I have a little shop with little tools and a little bench with little things on it. lol I do have a little shop, It does have lots of tools/materials in it, I will be getting more hopefully soon. 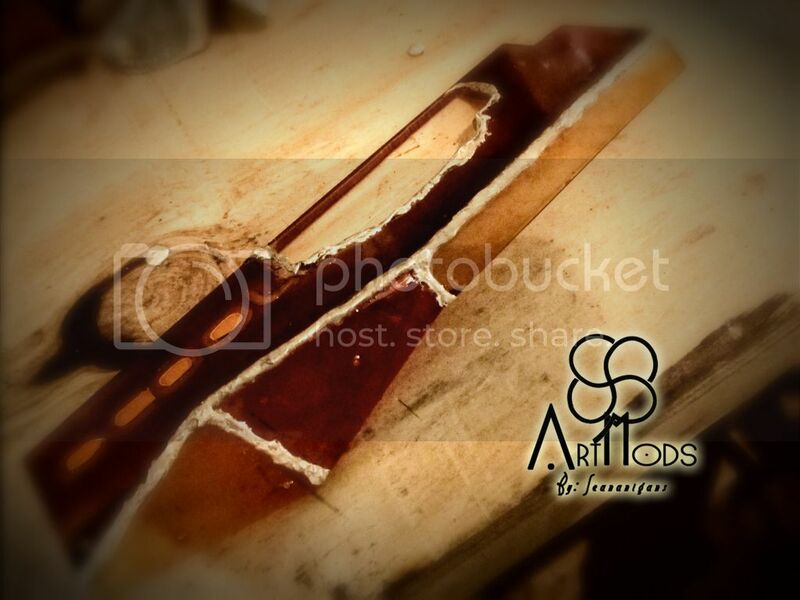 The ArtMods shop never stops being upgraded, always evolving with my mods. Thanks! there is more to come! I will share more pics as I make more progress. Sorry for the long break in updates. I've been trying to update but it keeps telling me there is foul language, which there is none. I'll figure it out lol I have a lot of updates for you all! 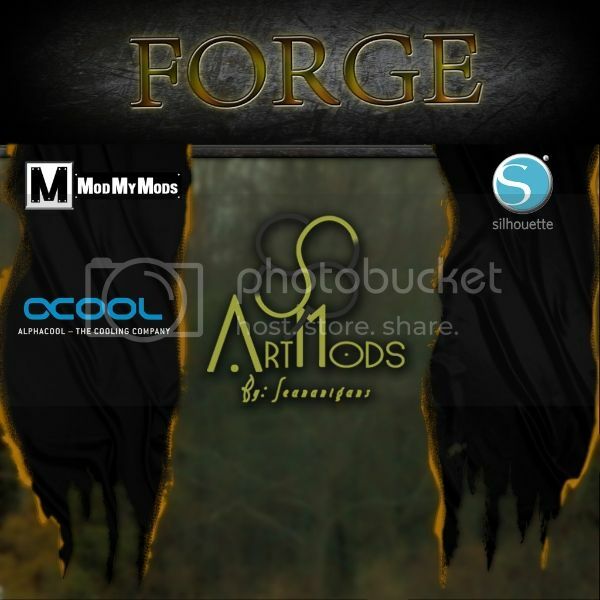 We are making progress with FORGE! I received lots of goodies from my sponsors: ModMyMods and Alphacool and I want to thank them so much for their support! The Old place holders are now all gone and I started making the new PSU cover! The PSU needed ventilation, so Instead of making a slotted type vent, I made the decision to go with an open look as if it was a "funnel" for the bellows to push air through. There was a lot of thought to go into it deciding if I wanted to make it look industrial or hand made. I decided on Industrial so that I could give a few harsh lines in the design of the interior. Next was the design of the Image itself. The Old Anvil logo I originally made was too much and didn't tell much of a story. 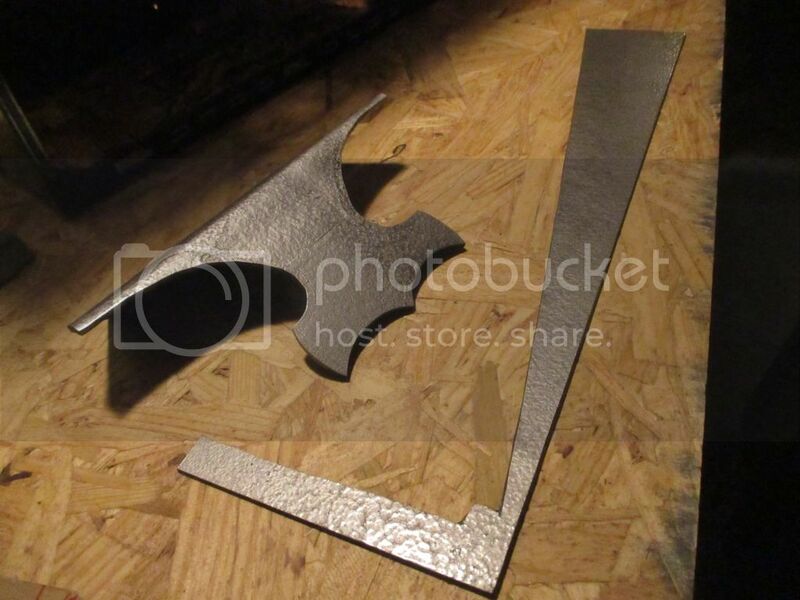 So I re-designed the anvil with a raven flying above. The Raven signifies a passing of a soldier in battle. This stems from the Old Norse Mythology. In short, The Valkyries would take the form of a raven and choose who would pass on to Valhalla. 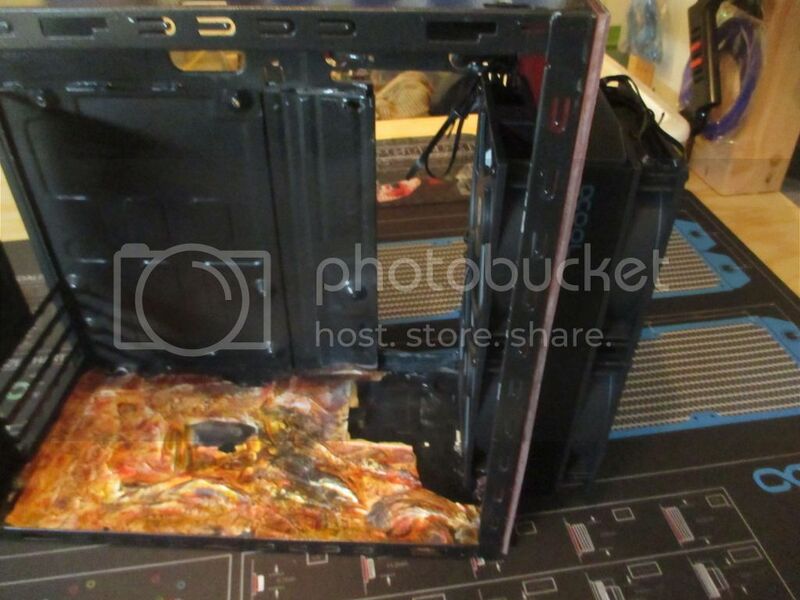 This tied into the theme and story of this case mod very nicely. 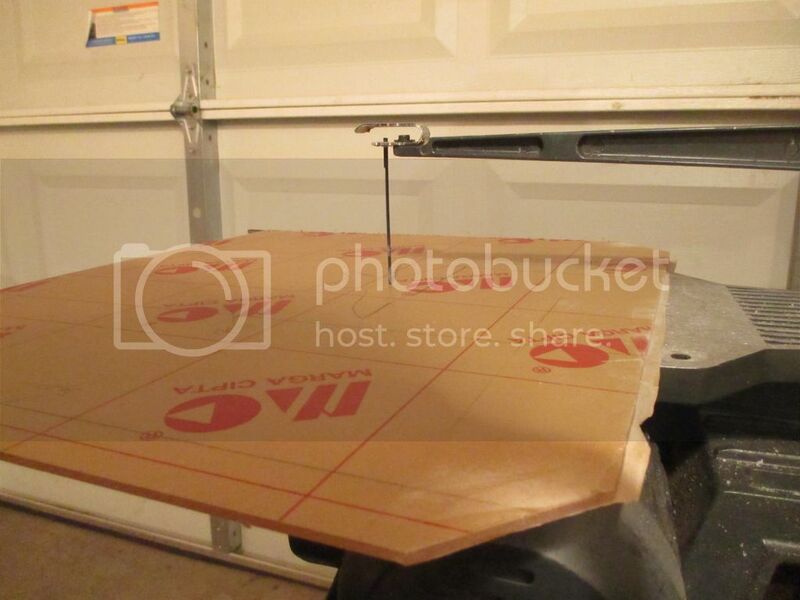 I used the Silhouette Cameo 3 to cut the stencil. 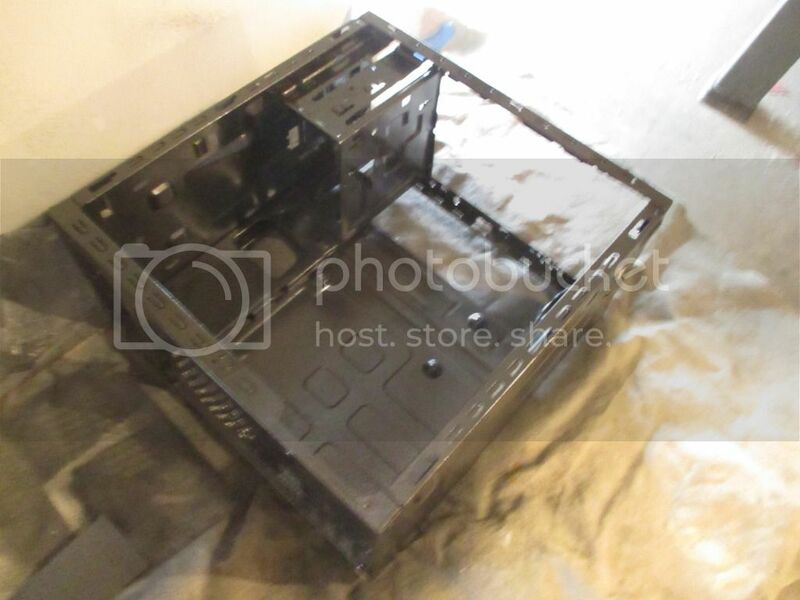 Once cut, I placed it on the PSU cover and then started applying the primer and finish coat. After that, I wen't back to the back panel to add the ArtMods Logo. The back was too dull and I wanted to add the logo somewhere, so I thought Id blend it in with the back panel of the case. 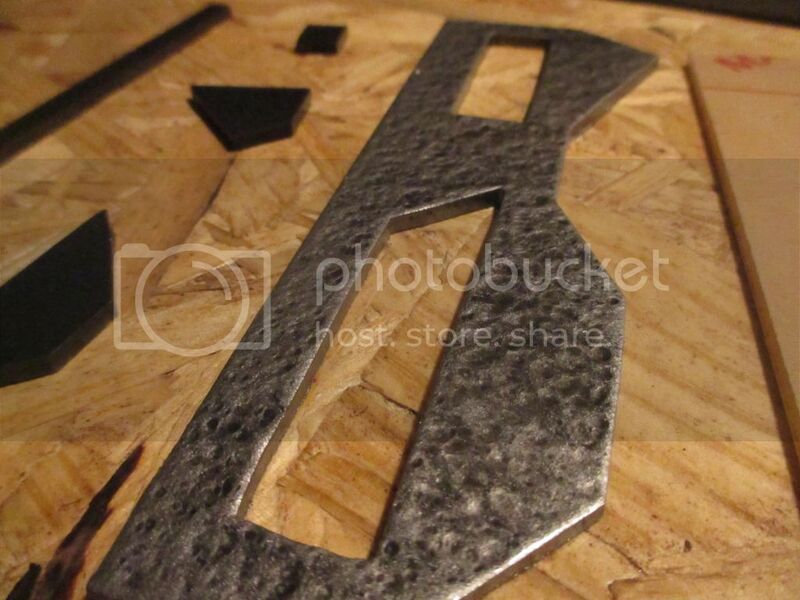 I used 400g sandpaper to smooth out the paint, then Vinyl to make a "raised" logo. then once applied I went back over it with a finished coat. Then it was off to working on the front radiator. I ran into issues with the Optical Drive Bay blocking space the radiator needed. I made the decision to cut it out and make a mount. I bought some of this scrap acrylic from the local plastics shop, it's holographic and looked like wavy fire, so I decided to use it for the radiator mount. I cut it, sanded the edges down, and used the MNPCTECH radiator template to guide my marker. From there, there was more cutting and then I riveted the mount to the case. 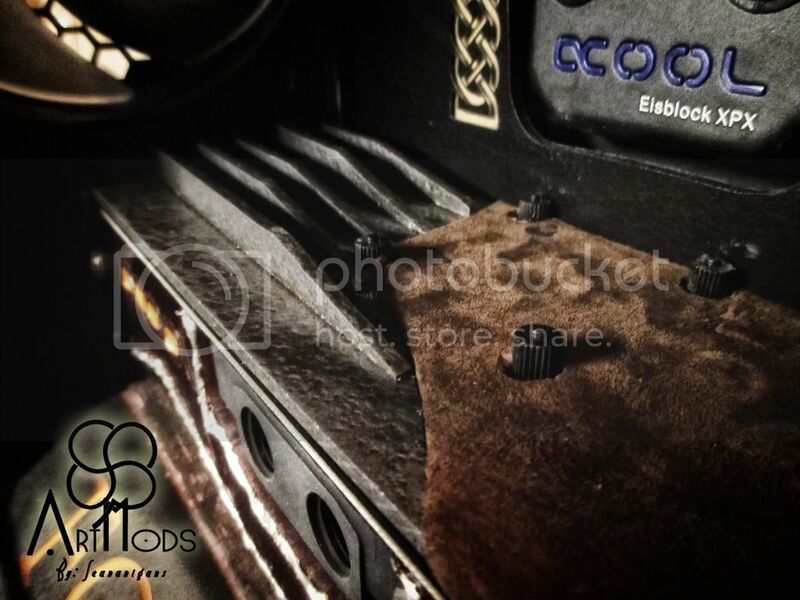 I then did a mock up using the Alphacool NeXxoS ST30 Full Copper Radiator and EK Vardar 120mm fans. Now I am working on the Pump mount/SSD mount. FORGE is coming together! In this update I am working on most of the details and trying to set the mood/tone of the case keeping in mind the viewers eyes and where its drawn to when looking at the Mod. I started off with the name plate. I used: Cast Acrylic, Vinyl, Balsa wood and lots of paint. 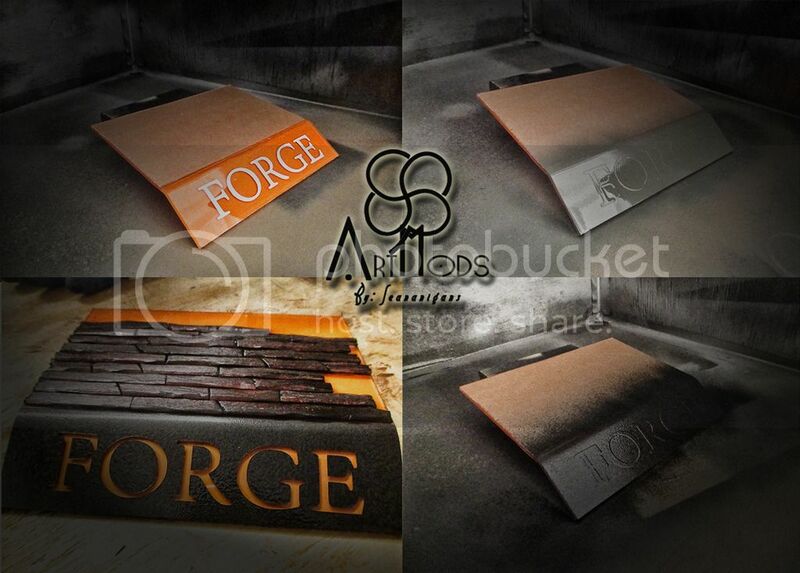 The Vinyl was used to mask off the FORGE name lettering and applied underneath to give it an orange base. I left on some of the original paper that comes on the acrylic so that the paint doesn't get on the top of it. 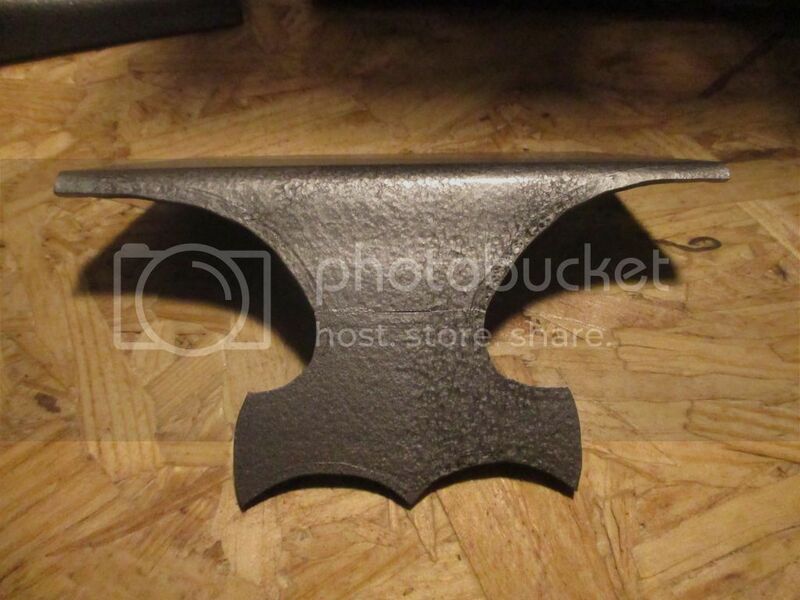 From there I used a self-etching primer and then the Black hammered metal faux finish paint. after that dried I cut up some strips of balsa wood, glued it down, then went over with a knife carving out the edges to make it look like wood planks. From there I hit it with 2 layers of red wood stain. After the name plate was put on the drying rack, I then started on the motherboard cover. I thought that the motherboard added too much technology to the design of the case so I had to figure something out to change the look. So I came up with this. After the cover was completed I then remade the top flange for the front of the case. This was done with Acrylic, Vinyl, paint and lots of patients. In these images I do not show the complete fully painted product. I do apologies. The reason for that is because I am adding some fine painting detail to it and wanted to save it for a later update/tutorial. So in the coming days You will see the final images of this. Lastly, this brings us to the window shroud. The Chainmail. This took hours. Actually it took about 2 days including the painting and weathering. I made this almost from scratch (I did not make the rings them selves). 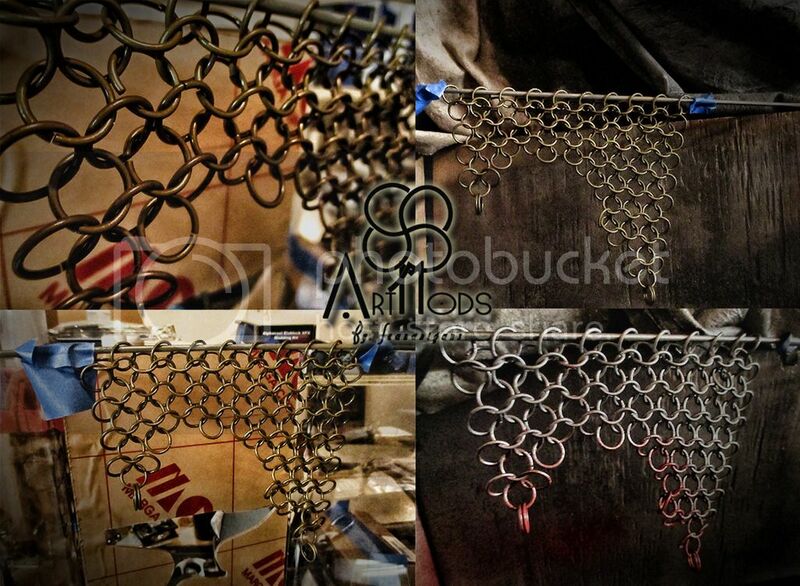 This was my first time making chainmail and it was a journey of its own. I purchased the rings and all I had to do was put them together..right? You have to do it a certain way and then they all get tangled and mangled and don't lay flat, then you miss a spot and nothing lines up... BUT! It got done! And I think I did a decent job for a first go at it. I then applied layers of paint and finally, it started to come to life. 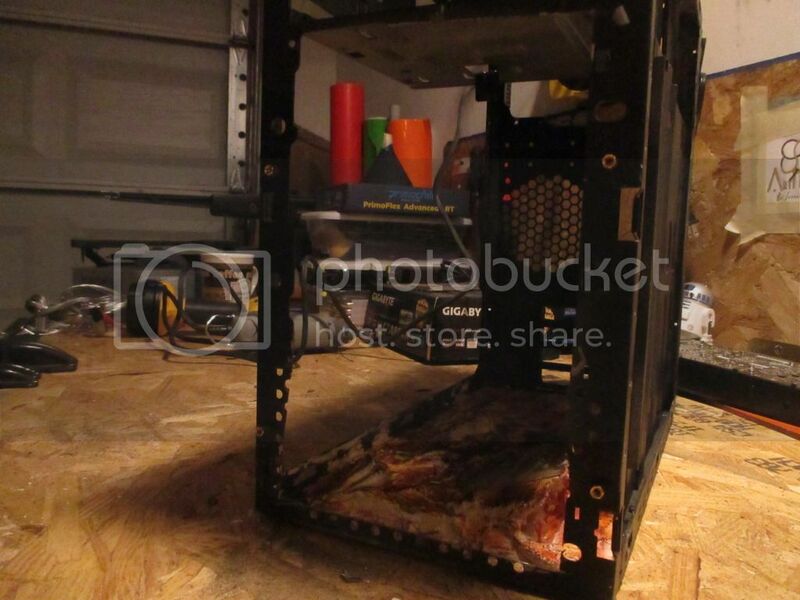 Now, keep in mind, this case mod tells a dark story. Thank you all for viewing my new update! There is more to come! Thank you so much! That means the world to me Its getting close to finished. So hopefully I can have a few more updates and a video for you! As we approach to the final hours of FORGE, I This update will be one of the last before assembly. 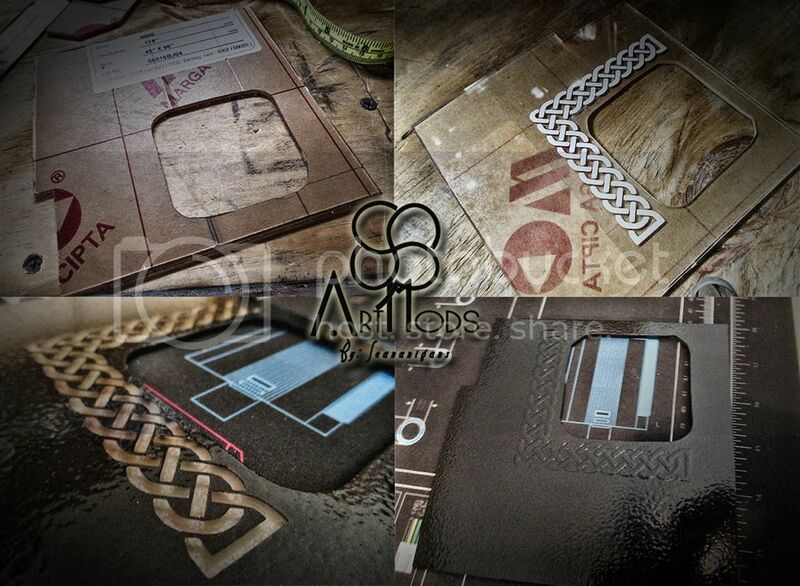 We will be going over some fine details and creating the "look" through paint, texture and fabrication. Lets start off with the Radeon RX 460. Watercooled. Now, I know you might be thinking "why are you doing this?". Well to answer your question I'll ask you a question back. Why did I see a mini van with a 4" lift kit on it driving down the road? Because they could, and they did..
Any way.. I started out by removing the ASUS Strix heatsink and shroud from the GPU, Cleaned off the Chip and then applied thermal paste and added an Alphacool NexXxos GPX Solo. It was a little bit of a tight fit, but it fit. 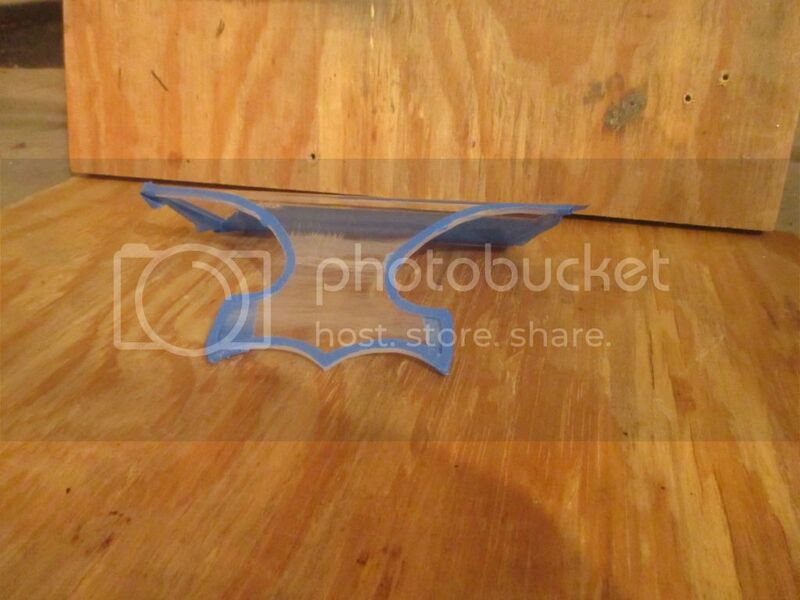 Then I started on the back plate with some 1/8th cast acrylic. 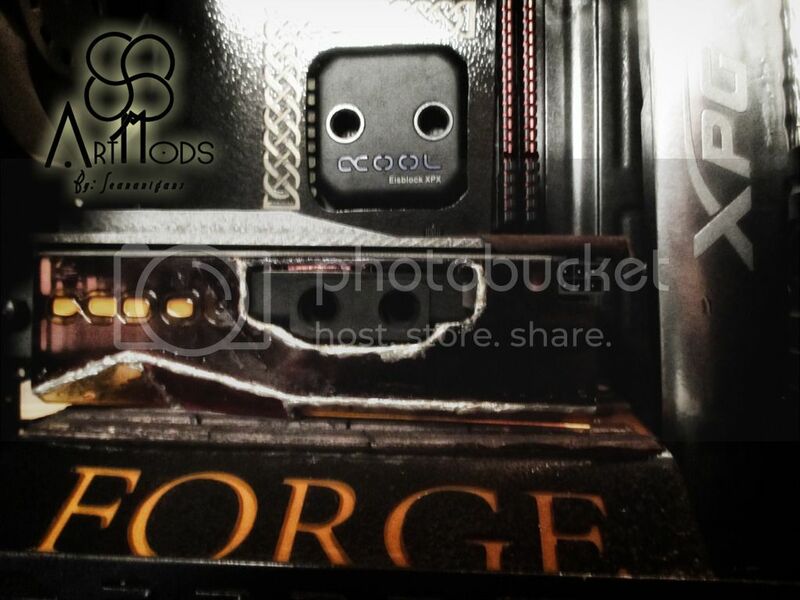 The design is based off of the Alphacool heat fins on their Full GPU blocks. I wanted to keep the theme so I made the "fins" a bit smaller and added an angle that will run off into a flat leather plane. I liked where it was going, but something was missing. Like every good story there has to be a part that draws emotion, that really catches your attention and makes you feel. To me Stained glass was the answer for this build. I decided I wanted to make a stained glass shroud for the GPU. I think it represents the Viking era very well and adds some "awe" to the theme. The original stained glass I did was too heavy for that small GPU so I had to make it out of acrylic and give it a nice faux finish, then connect it with solder, just like I would with real stained glass. And then you have the final results. NOTE: I had to cut down the back plate because the Motherboard cover went out half way across the GPU due to the long screws on the Eisblock. Speaking of the Eisblock! 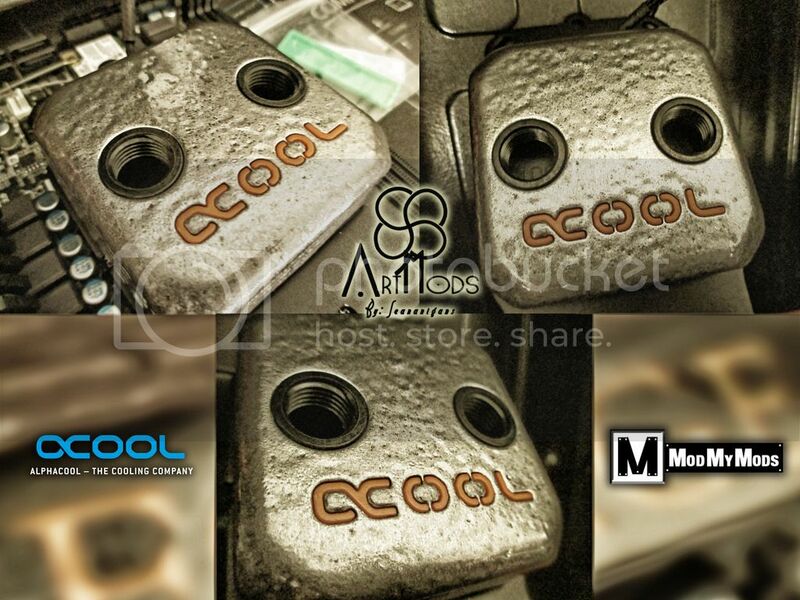 I received the Alphacool Eisblock Mod kit from Alphacool and did a little faux finish on that as well making it look and feel like forged steel. That concludes the most recent update. I had some PSU cables made and they just came in to the shop today! I also received some awesome soft and hard plastic drill bits from LMT Onsrud to try out. 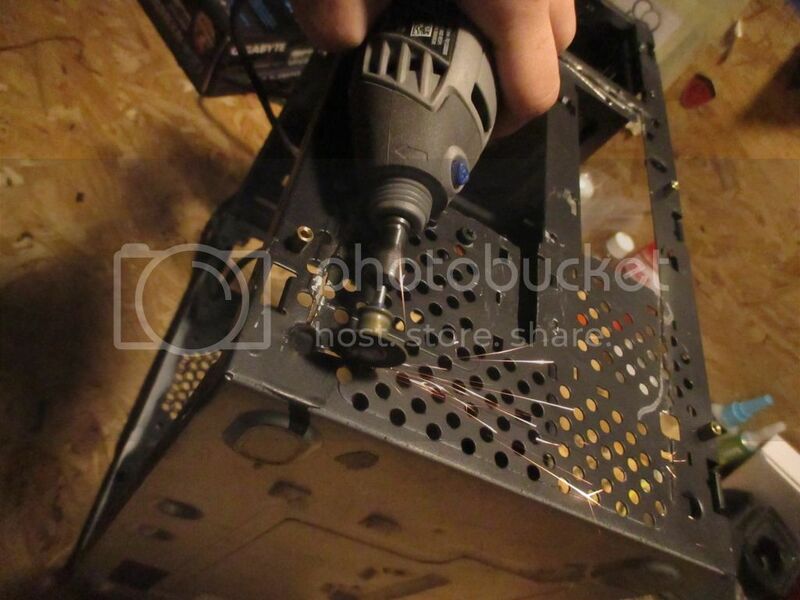 So my next update will start with drilling some holes in the custom reservoir and tapping it. 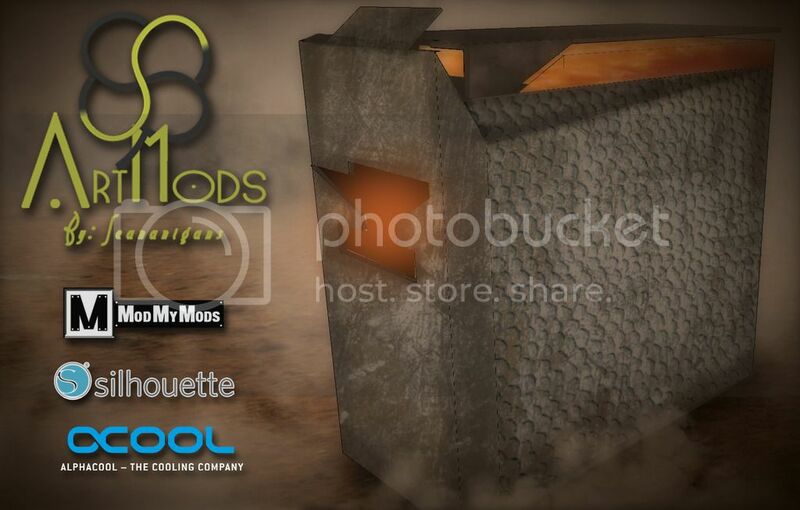 Your photobucket account disagrees with this post artmods! Yea I have no clue what is going on with them. They took down my photos in my WorkLog for the MSI PRO MOD too and I cant fix it at all. Im not very happy. I will be replacing these once I make a new update. Sorry everyone!